How to read US sectional charts? How the airspace class influences your flying, which airspace to avoid and where you are free to do what you want? And where dragons are? 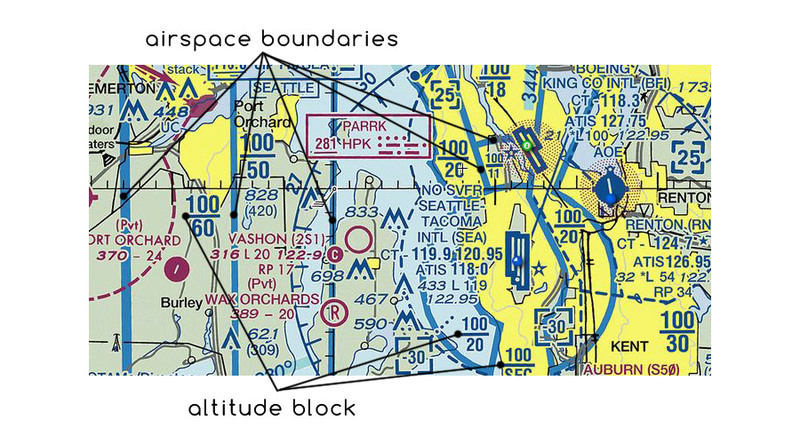 How airspace classes are depicted on sectional charts? What other zones and areas are shown? How airspace types and designated areas restricts your flying? Class A is IFR only airspace. You can not fly VFR in class A. Unless you are cleared otherwise – you need to be under ATC control while flying in class A airspace. Airspace boundaries are depicted with solid blue lines. A stronger line (far left on the image above) is used to emphasize outer boundary of B class airspace. Numbers show top and bottom of airspace in hundreds of feet (so 30 means 3,000ft, 100 – 10,000ft, SFC stands for “surface”). It’s a controlled airspace. Both IFR and VFR flights are positively controlled (this means that they receive and have to follow ATC instructions). Aircraft flying into B class airspace need a clearance prior to entry. Always obtain clearance prior to entry. VFR flights are separated when flying in B class airspace. 200KIAS speed limit below class B airspace. In some cases VFR corridors passing through B class airspace may be defined. This “FLY” chart shows VFR Corridors (magenta arrows) passing through B class airspace around LAX. Always check the chart or additional documents to know whether you need a clearance to fly in this corridors. Over Los Angeles you do not need such clearance (but you have to fly at specified altitude – 3,500ft / 4,500ft (south-east / north-west). Seattle B class rules require you to obtain clearance to fly similar corridors. Technically – aircraft flying in this corridors is not in class B airspace. Just like with B class airspace, C class uses solid lines and numbers showing altitude block. Color is different here – lines and numbers are in magenta. It is a controlled airspace for IFR flights. Are required to maintain two way radio communication with the ATC. Clearance to enter is not required. 200KIAS speed limit applies at and below 2,500ft above ground. VFR minimums have to be observed otherwise a Special VFR clearance is required. Dashed blue lines show boundaries of D class airspace – in this case it’s an airspace around Juneau Airport. Number in the dashed square informs about airspace vertical limit – in this case 25 = 2,500ft (above mean sea level). Minus in front of such number (not visible here) means “up to but not including…”. Apart from airspace otherwise defined it extends from 1,200ft above ground to 18,000ft (above mean sea level). E class airspace beginning at the surface is shown by the dashed magenta line. Wide, faded blue lines and zipper lines show areas where E class airspace begins at 1,200ft or a greater altitude. Numbers define the altitude where E class airspace begins inside this area. The airspace that is not defined otherwise. Usually the airspace below 1,200ft and above Flight Level 600 (60,000ft). Flights are prohibited inside P-areas. “Here be dragons”. Restricted areas are areas where operations are hazardous to non-participating aircraft. For example aerial gunnery, missile firings, artillery fire. Although flying in restricted airspace is not entirely prohibited – it requires a clearance from appropriate ATC facility. Some restricted areas have their operational times published. In such cases pilot may fly through the R-area outside of these hours. In some areas (like R-4808 N – otherwise known as Area 51) you will never get the clearance. Areas where military performs exercise (so lots of high speed flying aircraft to be expected) but no one will shoot missiles (at you or at anything else). IFR traffic can be routed through an inactive MOA or if separation with the participating traffic can be provided by the ATC. Otherwise IFR traffic is routed around a MOA. VFR flights do not require clearance to enter of fly through MOA but it’s highly advisable to obtain information about traffic. All pilots (including military pilots) are equally responsible for collision avoidance. It was difficult for me to find one but finally I did. No clearance required – all aircraft (including participating) are equally responsible for collision avoidance. Alert Areas inform nonparticipating pilots about high volume of pilot training or unusual flying activities. Areas where military performs live firing. All activities are suspended when a non-participating aircraft approaches the area.